Eager to escape the wet Irish winter and to practice our skills in winter hill walking we booked a cheap Ryanair flight to Kraków in Poland. Our target was the Tatras mountain region in S. Poland and N. Slovakia. In winter the highest summits are difficult to reach and in Slovakia the high mountains are closed from November to June, but there are plenty of low level routes which are easily accessible in winter. From Kraków we drove south to Sromowce Nizne on the edge of the Pieninski National Park on the border between Poland and Slovakia. The Dunajec River marks the border and a footbridge constructed in 2010 allows unrestricted access between the two countries. East of the Sromowce Nizne, the river enters a narrow limestone gorge and is popular for rafting in the summer. In the winter there is an easy walk through the gorge on the Slovakian side. On the Polish side is the Trzy Korony massif (Three Crowns) of which the highest peak is Okraglica at 982m. There is a fine circular walk to the top of Okraglica which took us about 4 hours. In Sromowce Nizne we stayed in the Hotel Nad Przelomem. A drive into Slovakia lead us to the High Tatras mountains and the Slovakian ski resort of Štrbské Pleso. Many of the nearby towns also provide accommodation for skiers and these have an uneasy mix of pre-WW2 architecture and gaunt Communist concrete blocks. Keen to avoid the skiers, we headed for the mountain hostel (Horský Hotel) at Popradské Pleso. 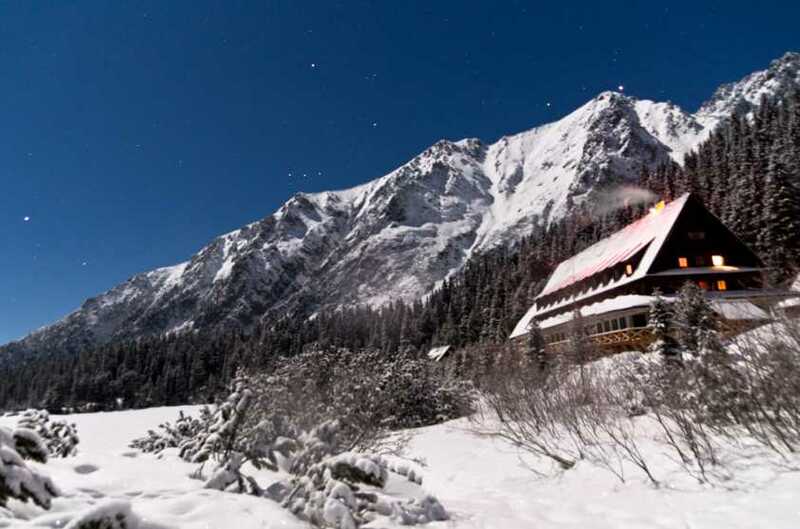 This hostel is used in summer by those climbing the highest mountains in Poland (Rysy at 2499m) or Slovakia (Gerlachovský štít at 2655m). A 5km walk is needed along a well marked track to get to the hostel. Our next stop was in the Malá Fatra mountains about 25km east of the city of Žilina. We stayed in the Hotel Diery near to the village of Terchová on the edge Jánošík National Park (named after an early C18th Slovakian Robin Hood like figure). Here the main attractions are the spectacular Jánošík limestone gorges along the River Diery. We followed the gorges to a col at 1200m (Medzirozsutce) using a variety of fixed ladders, bridges and cables. From this col we climbed Malý Rozsutec (1344m). In winter the climb of Malý Rozsutec was exhilarating and challenging to say the least and crampons were needed in places. There are fixed aids on the steep parts of the route but many of these where buried in snow and ice, so protection from precipitous drops was minimal. From the summit of Malý Rozsutec, a very steep climb down a gulley is the prelude to a long descent through mature forest back to the hotel. Here the food and drink was exceptional, served in a traditional Slovak restaurant. We highly recommend a visit to this part of Eastern Europe. There is plenty to satisfy the tastes of all hikers. Just as good is the great value of the accommodation, food and beer. If you are interested we have uploaded videos onto YouTube (http://youtu.be/ihEiWCBRsgM and http://youtu.be/hGhE785tBNE).